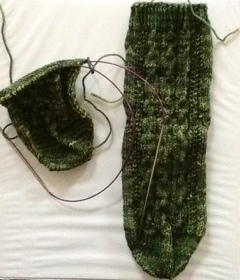 Knitting: First WIP is closed! My goal for the day was to finish a pair of socks I started long ago. September of 2010 to be exact. 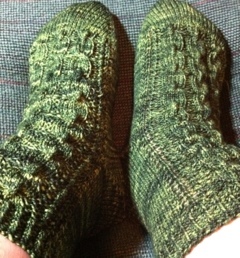 It was a mystery sock by Michelle Hunter offered through Temptations. I was originally off to a great start and finished the first one quickly, but for some reason the 2nd one just languished. But not after today! I have reclaimed my needle! YAY! So I decided maybe Sundays would be a good day to catch up on WIPS. I’m usually home and doing household things like Laundry and dishes. So what better way to break up that tedium than with knitting. Up first on the block is my Axis socks. They’ve been lingering too long. Maybe today they will be finished or at least close to it!